Bright purple organic beetroot adds a fabulous splash of colour to your plate. Whether you’re after the health benefits of beetroot juice, want to perk up a tray of roasted veg or just need something quick and easy to grate into a salad, this purple root will see you right. Our fresh beets are worlds apart from the vinegary, crinkle-cut stuff in jars. Tender summer beets are best boiled or roasted and eaten straight up, or grated raw into salads. As the winter progresses, the roots lose some of their freshness and become softer. This is the time for a hearty soup, laced with ginger and orange zest. 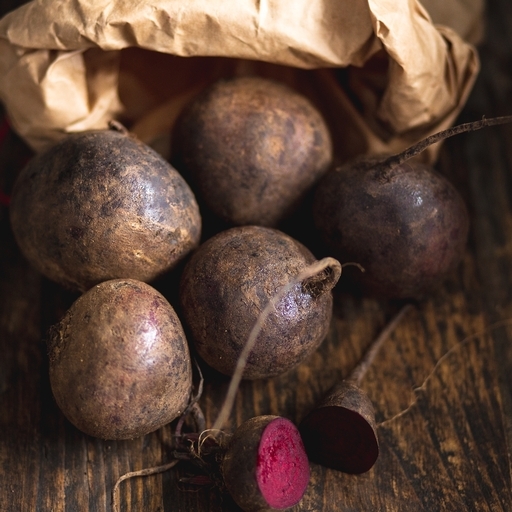 And don’t keep it all your beets for the main course – their earthy sweetness is a fine addition to brownies and cakes. Keep unwashed in the fridge or on a cool veg rack.